Thanks to "Weird Al" Yankovic, air raid sirens and shouted death threats conjure images of the holiday season as much as jingling bells and the click-click-clicking of reindeer paws. But even if he hadn't recorded cult carols "Christmas At Ground Zero" and "The Night Santa Went Crazy," Yankovic's 30 years of skewering pop culture would still qualify him to team up with former Mystery Science Theater 3000 writer-performers Bill Corbett, Kevin Murphy, and Mike Nelson to poke fun at the malformed stocking stuffers featured in RiffTrax LIVE: Christmas Shorts-Stravaganza! Before the show goes live in more than 480 movie theaters on Wednesday, Dec. 16, The A.V. Club spoke to Yankovic about treasured Christmas traditions, giving the gift of his latest greatest-hits compilation, and playing to what is arguably his biggest audience ever. The A.V. Club: You're going in front of a huge nationwide audience as part of the RiffTrax Christmas special. How do you feel about playing to that many people at once? "Weird Al" Yankovic: [Laughs] Oh, gosh. I've never done an event quite like this. It's like a pay-per-view sort of thing. This should be a better experience than the proposed grudge fight with Kevin Federline which we were going to do a simulcast for. That never materialized. AVC: Do you know exactly what you'll be riffing on yet? WAY: I actually just got the DVD in the mail yesterday. It's basically a pork-based musical. It's sort of a singing infomercial. I don't want to give away too much, but it's a very bizarre piece of cinema. AVC: How does that tie into Christmas? WAY: I'm not really even sure how Christmas-y it is. It seems like it's an evening full of Christmas-related material and then a musical about pork. I'm not quite sure how that all fits in. AVC: Are you a fan of Christmas movies in general? WAY: Gosh, I watch Jingle All The Way pretty much every other week. It kind of informs my life. 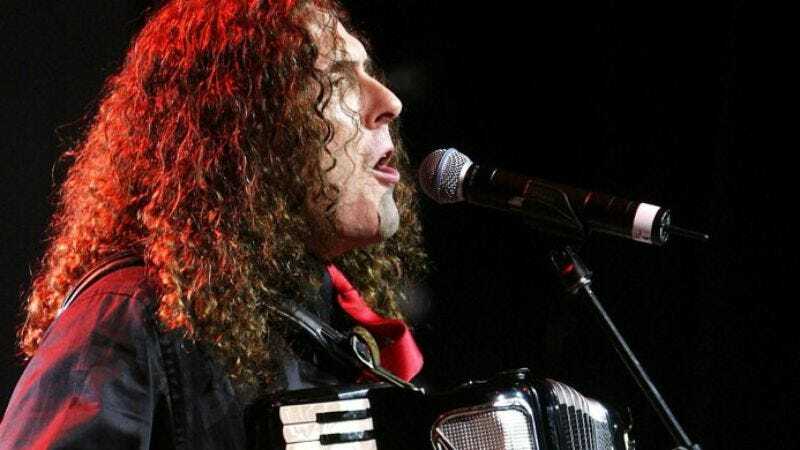 AVC: What are some of the holiday traditions around the Yankovic household? WAY: There's the yearly bobbing for pork, of course. That's probably why they asked me to do this part of the RiffTrax special, now that I think about it. AVC: Your newest greatest-hits compilation, The Essential "Weird Al" Yankovic, came out in October, just in time for holiday gift guides. Do your best to convince our readers that the album is the perfect Christmas or Hanukkah gift. WAY: I don't know how your friends or loved ones will truly know that you love them unless you purchase The Essential "Weird Al" Yankovic for them. I mean, come on, it's 38 essential tracks crammed into two CDs, with a 24-page color booklet, remastered for your enjoyment. If you don't receive this under your Christmas tree or Hanukkah bush, you will truly know that you're not loved. AVC: "The Night Santa Went Crazy" is on the album, but you have more than one Christmas song in your repertoire. Why no "Christmas At Ground Zero"? WAY: Yeah, I was going to put them both on there, but I didn't want to make it too much of an overkill on the whole Christmas thing. AVC: Was there also some concern over "Ground Zero" because of the connotations the term took on after 9/11? WAY: That was part of the decision as well. "Ground Zero" has taken on a very specific connotation, and even though the song was written in 1986, when "ground zero" was an unspecific epicenter for nuclear annihilation—good times; those were much more innocent days—I just felt that the phrase probably is not going to be part of our lexicon in that fashion for quite some time. AVC: What would you say those two songs have contributed to the Christmas music canon? WAY: [Laughs.] I think those are two of the most popular, non-grandma-killing Christmas novelty songs that I can think of off the top of my head. Other than that, I don't know. A long time ago, my record label wanted me to do a whole Christmas album, and when I started cranking out these dark, violent Christmas songs, they quickly decided that that probably wasn't the direction to go. AVC: Probably best to spread that sentiment across two albums released 10 years apart. WAY: Yeah, I try to only do Christmas songs once every decade or two. AVC: Have you ever considered doing a direct parody of a Christmas carol, or is that too obvious? WAY: There seemed to be a lot of those already. [Radio personality] Bob Rivers does that kind of stuff extremely well. So much of my oeuvre is parodies already, it seems like doing parodies of traditional Christmas songs—it just didn't interest me quite as much as coming up with something original, although in the style of somebody else.